Far from uniform, Jews disagreed over the way to honor their traditions and practice their faith. In the first century of our era there were many sects and schools in Jewish society. We hear about the Essenes, of course, the Jews of Qumran, the Dead Sea Scrolls, who separated themselves from the community at large and clearly constituted a sect, a group which thought it alone possessed the truth. Whether there were other sects or not it's hard to tell. We know instead about other groups or schools or movements or parties.... The most conspicuous of these parties or schools will be the Pharisees. The Pharisees are known to everybody from the New Testament where they enjoy a very negative press. They clearly are seen as the opponents of Jesus and "the bad guys." Who the Pharisees really were is a different question entirely, once we get past the Jewish polemic, the anti-Pharisee polemic of the gospels. And we realize the Pharisees were a conspicuous Jewish group. They seem to have been a scholarly group or a group of Jews who, as Josephus the historian says, had a reputation as the most meticulous observers of the ancestral laws. So here is a group which claim expertise [in] understanding the Torah of Moses and claimed expertise in the observance of the laws. And apparently most Jews were prepared to accept that claim.... Their opponents, of course, were the Sadducees, who were no less pious than the Pharisees, but the Sadducees did not believe in the authoritative nature of the ancestral laws. What did the Sadducees do then, exactly, we don't really know. Except the Sadducees apparently had a great deal of following among the well-to-do, among the priestly classes, and seem to have been characterized primarily by two things. One, they opposed the Pharisees and two, they denied belief in the resurrection of the dead, a belief that the Pharisees espoused and the Sadducees denied. And this, of course, made the Sadducees famous as we see very clearly in the New Testament passages where the only thing in the gospels you know about the Sadducees is basically that they deny the belief in the resurrection. But aside from these groups that we may call schools or parties - the Pharisees appear to us to be a school and the Sadducees appear to us to be a party, a social-political party - there will have been a whole wide variety of other groups in Jerusalem and perhaps in the countryside as a whole. Some of these are political movements..., the revolutionary groups, Sicarii and the Zealots and whatnot, who took their religious understanding of what Judaism was, took their religious interpretations and turned that into a political agenda. "We must destroy the Roman Empire or we must destroy Jews who cooperate with the Roman Empire. We will kill all collaborators, no King but God," and other such slogans emerge from these religious thinkers. And of course, the most important group of all are not the Pharisees, not the Sadducees, not the Essenes, not the revolutionaries, but the plain Jews. Plain simple folk who presumably live their Jewish lives by following the ways that they'd always done, whatever mother or father had taught them, that's what they do themselves. We may call [this] perhaps "simple piety." 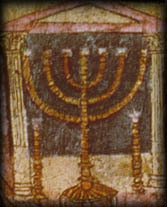 The Jews who observe the Sabbath, who observe the holidays, the festivals, who go with the pilgrimage to temple, who observe the Jewish food laws, the Jewish rituals, believe in the Jewish God, follow the ways by which to make the life holy, follow the dictates of the Torah in a kind of simple plain way, these are the plain folk and these are the folk who are not Pharisees, not Sadducees, but simply plain Jews. And we get a glimpse of some of them in the pages of the New Testament. But these are probably the most numerous of all and the most important of all. [Josephus' two books] are two of our prime sources for the history of this period. And Josephus gives a kind of catalog for what the major groups are within first century Judaism.... He talks about the Sadducees, the Pharisees, the Essenes. He also mentions another group, [for whom] my label is Insurrectionists. That's not his term for it, but he attributes to this group of people the rebelliousness and weariness with Rome that ultimately led to the Great War against Rome in 66 to 70, eventuating in the destruction of the Temple. It's hard to tell exactly how close Josephus' descriptions are to what these groups actually believed and thought. The Sadducees are usually associated with aristocratic Priests, therefore they're in Jerusalem. They seem to not have thought that there was resurrection of the dead, which by this period is almost a normative belief in Judaism. And, since they were Priests, much of their religious interests focused on the smooth operation of the Temple, as is right, because that was their responsibility. Pharisees, on the other hand, were a school of interpretation of Biblical text.... Priests are family groups in Judaism. If you have a friend named Cohen, that means he's a priest. So one is born a priest. One can't choose to become a priest, unlike most other religious groupings in antiquity. But, if somebody is born a priest, he could decide to interpret the Bible according to a Pharisaic tradition, and that's what happened. These are not absolute boundaries. These are permeable identifications. Josephus, for example, this historian we have is from a Jerusalem-like, priestly, aristocratic family, but he aligns himself with the Pharisees, which is one of the reasons why he praises them so much in his books. But how many people are we actually talking about?... [W]e have no way of testing [Josephus'] numbers, but if they're like any other kind of guess done either by a modern newspaper or by an ancient historian, they're not absolute. He mentions ... I'm not absolutely certain. I think his figures are like 6000 Pharisees, 4000 Essenes...maybe there were 20,000 Priests. Of those Priests, how many were aristocrats and therefore Sadducees? I don't know ... but a fraction of that. So that doesn't give us very many Jews actually accounted for. But there were millions of Jews in antiquity, which means that most people belonged to none of these groups. Who were these people? What did they think? We don't know because we only have the evidence for the groups that have articulated ideologies. I think we have to assume that most Jews who did not associate with one group or the other did the best they could interpreting what they thought was leading a Jewish life according to how the Bible happened to be interpreted in their neighborhood. Again, this is the vast majority of Jews, and as is the case with most populations in history, it's a silent majority because we don't have written evidence from them. [At this time, is] Judaism a religious life that's unified and at peace with itself? It would be a mistake to think of Judaism in this period as a state religion, even though the temple is the centerpiece of Jewish life and of Jewish worship. There's no such thing as a state church. It's not a monolithic religious or cultural entity at this time. Indeed, what we're seeing more and more through the research and the archaeological discoveries, is how diverse Judaism was in this period. So we see different groups, such as the Sadducees and the Pharisees. We also see a number of new religious texts and new practices starting to develop. .... For example, let's not forget that the Holy Day, the festival of Hanukkah, was a relatively new holiday celebration at the time of Jesus. It had only been around for something like a hundred years. But it shows some of the new ideas, the new experiences that Jews have had to overcome in that time. And so, we're watching a religious tradition that is itself still going through certain changes. Some of those changes were met with a view of optimism and progress. Some people, though, might not have liked them. And so, this sets the stage for what we see as some of the tension and some of the controversy that also surrounds the temple. So the interesting thing about the temple in the days of Jesus is that on the one hand, it's a grand, new place. It's the center of life and worship. It's the showpiece of Jewish tradition. And yet, it could also be a center of controversy and tension. One of the best examples of the ...the kind of diversity and vibrantly different thought that's at work in Judaism in this period is, of course now, what we know from the discovery of the Dead Sea Scrolls. What are some of the principal groups who were a part of Judaism during this time period? What were some of their differences? 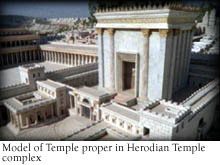 At the same time, the temple also serves as a source of division and a source of conflict in the Jewish community. Many, many Jews were unhappy with the way the priests ran the temple. The priests did not obey the purity laws properly. They didn't follow the right calendar. They didn't perform the sacrifices properly. The priests themselves were insufficiently pious. Their marriages were somehow illicit or improper. The priests used the office for self-aggrandizement, for self-advantage. They were somehow were making themselves wealthier at the expense of the community and on and on and on. We hear a series of such complaints about the priests, many of the them in the Dead Sea Scrolls, many of them found in Rabbinic literature, but some of course, as anybody who reads the Bible knows, going back to the prophets, even in Biblical times, complaining about the priests of the temple.... Nonetheless, it's clear among all the numerous groups within the Jewish community of the 1st century, that all of them, to justify themselves, have to some degree or other deal with the temple. They have to either explain why the priests are wrong and they are right, or they have to explain that the priests are correct but =they're only correct, insofar as they agree with what this group itself believes.... You can see that among virtually all the groups in Jewish society in the 1st century of our era. The second century of our era was an age of definition not just for Christianity but also for Judaism. In Christianity, of course, the second century of the common era is a time of sects and heresies and divisions and splits and schools of all sorts as Christians try to figure out exactly what Christianity is and exactly what Christianity isn't. On the Jewish side of the fence, we don't hear much about conflicting sects or heresies. Most of them seem to have disappeared in the wake of his destruction of the temple in 70 C.E. So we don't hear about then conflicting parties the way we do on the Christian side. But nonetheless, I think we can still call the second century of our era an age of definition, even on the Jewish side. Because it is the second century of our era that marks the emergence for the first time into the light of history of a new group and a new culture and a new literature and a new way of thinking and writing. We call the people rabbis and we call their Judaism "Rabbinic" texts or "Rabbinic" literature.... It is the rabbis who now emerge as a new kind of Judaism, and it is this Judaism that will endure from the second century of our era down to our own age.